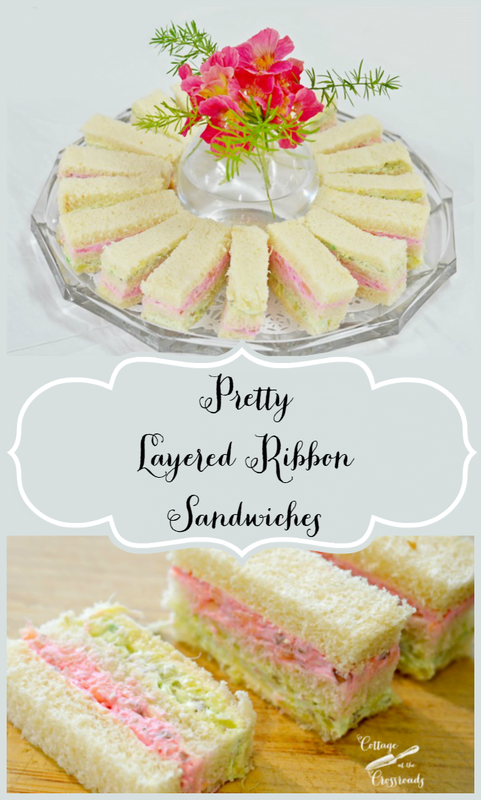 Doesn’t matter whether you call them tea sandwiches, finger sandwiches, or pick up food, these pretty layered ribbon sandwiches deserve to be at your next social occasion. A few weeks ago, I was asked to make some ribbon sandwiches for a retirement reception at our church. I said that I’d be happy to provide them if someone would tell me how to make them. You see, the word “ribbon” was throwing me. I had never heard them called that. 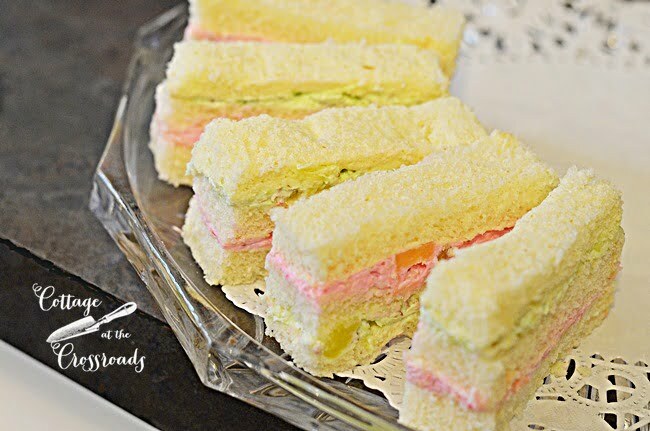 And I figured that if someone had to tell me how to make these pretty layered ribbon sandwiches,that I should pass along the info to all of you! 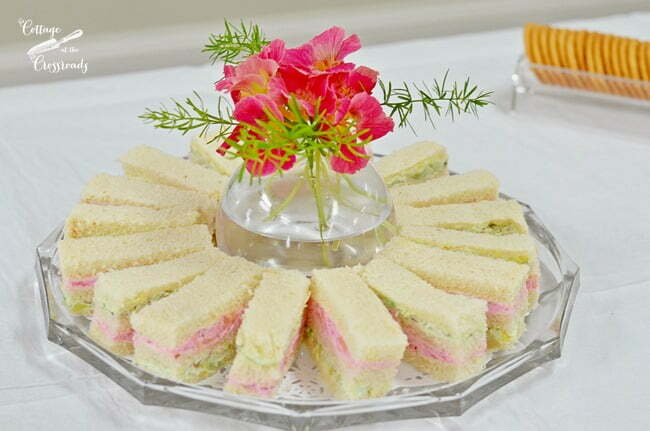 Their name comes from the festive ribbons of colored filing, and I have eaten plenty of these dainty sandwiches. But I’ve always called them finger or tea sandwiches. But no matter what they’re called, they are seriously the best little sandwiches! But I have to fess up and admit that I’ve never made them until this past weekend. To make the ribbon sandwiches, you will need some cream cheese, crushed pineapple, pecan pieces, and butter. Yes, I said butter! 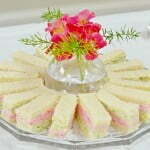 These sandwiches are FAR from healthy or diet food, but they are so good as a treat for a special occasion. 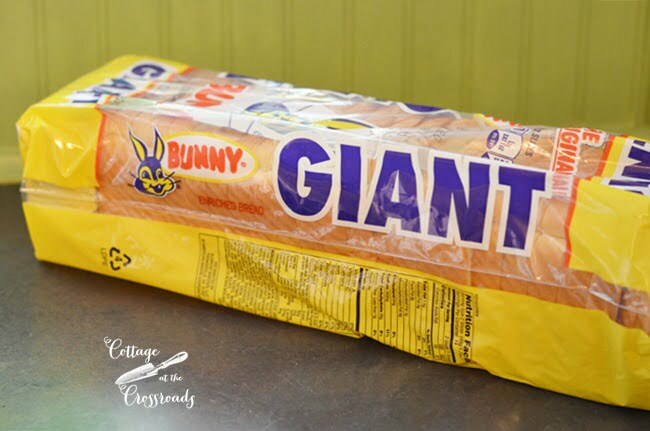 And you will need one or two loaves of square sandwich bread, depending on the number of ribbon sandwiches that you want to make. 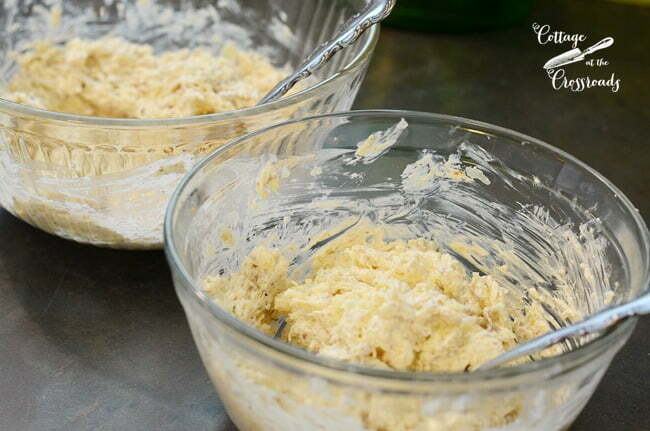 Allow the butter and cream cheese to soften at room temperature. Chop the pecan pieces very finely. 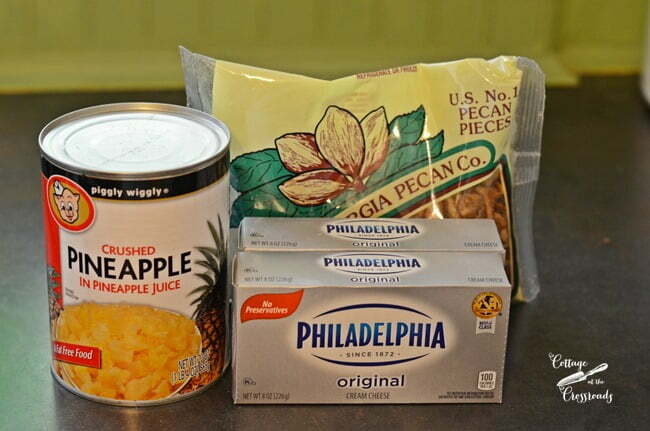 Divide the cream cheese, crushed pineapple, and pecans between 2 bowls. Mix thoroughly. To make the colored filing, you will need some food coloring. 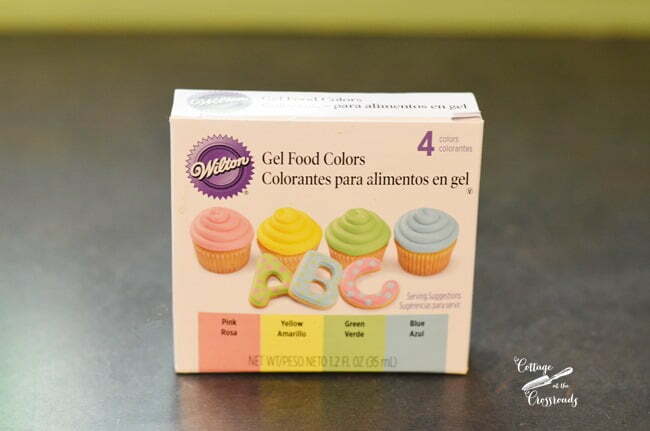 I haven’t used food coloring in years, so when I went to purchase some, I found gel food colors. The gel is so much easier to work with and control! They are such an improvement over the liquid ones. After adding a few drops of gel coloring, I had some pretty pink and green filing. 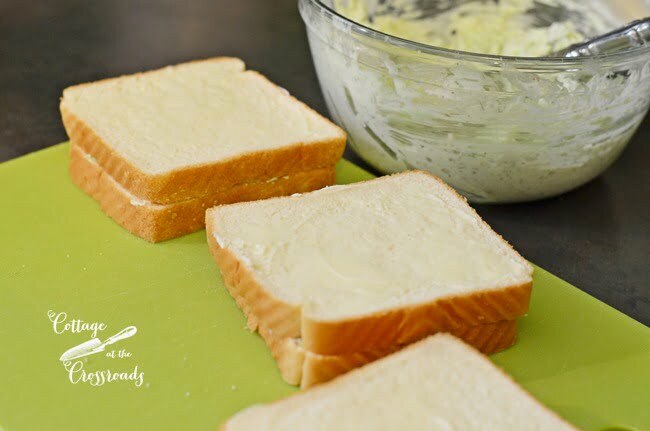 Spread a very thin layer of whipped butter on one side of the bread. The purpose of the butter is to prevent the sandwiches from getting soggy from the filing. I found that it was easier to work in stages. I buttered 6 slices of bread at a time. Then spread the filing over the butter. Butter another side of slice of bread and place it down on top of the filing. Then butter the top of that slice. Add the different color of filing on top of that slice, and then butter another slice of bread. Put it buttered-side down on top of the filing. So you will end up with a stack that looks like this. You will need to concentrate a bit to get all of this buttering of bread down pat. Ask me how I know!!! Lucy, our dog, was eager to eat any mishaps. When you finish making all the sandwich layers, it’s time to cut the crusts. Using a sharp, serrated-edge knife really helped with the cutting. As I was working with the sandwiches, I placed a slightly damp paper towel over them so that the bread wouldn’t dry out. At this point, I put them in a closed container and placed them in the refrigerator until it was time to cut them into smaller pieces. I cut each sandwich into 4 “fingers” so named because you cut them about the width of a finger! And here’s a tip that my sister-in-law Jean gave me. She said to wipe the knife each time you made a slice which helps to make nice, clean cuts. I placed them on a glass plate with a dainty doily and as I was arranging them, I had an empty circle in the middle. So I went out to the garden and gathered some nasturtium blossoms and a little asparagus fern. I’ll have to admit that they were a pretty addition to the table at the reception. 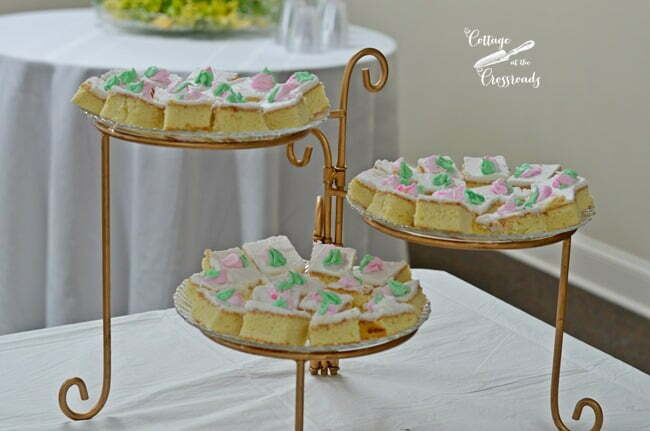 They matched the pink and green decorated cake squares that were nearby. The refreshment table held other yummy items and a pretty centerpiece. 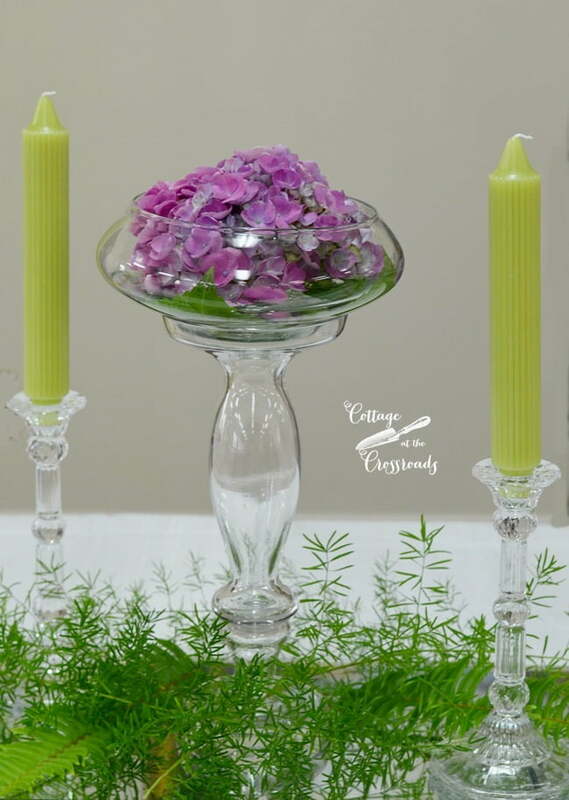 I thought this was a spectacular way to display one, single hydrangea blossom. It was sitting in a shallow glass bowl which was placed on top of a glass candlestick. So simple and elegant. 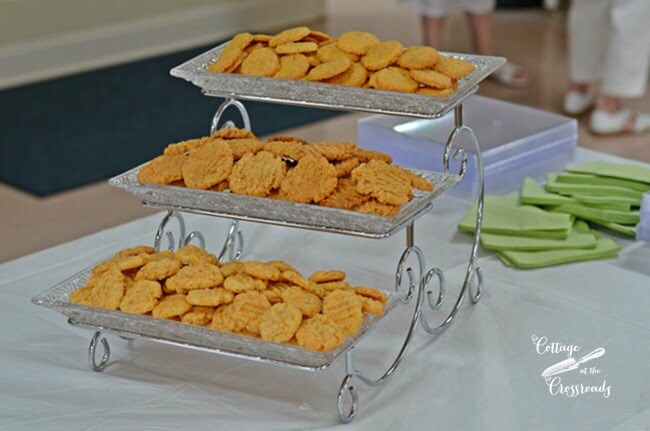 And you simply cannot have a Southern social event without cheese wafers, can you? The lime punch was very refreshing. I should know because I had about 4 cups of it! And just who were we honoring? Our beloved minister, the Rev. Mel Flail, is retiring. Oh how he will be missed! And here’s the complete recipe for the ribbon sandwiches. They are the perfect finger food for any social occasion. 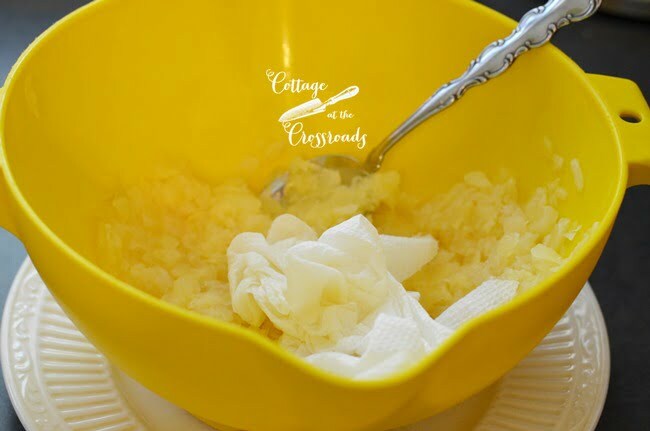 Divide the softened cream cheese, drained crushed pineapple, and pecans between 2 bowls. 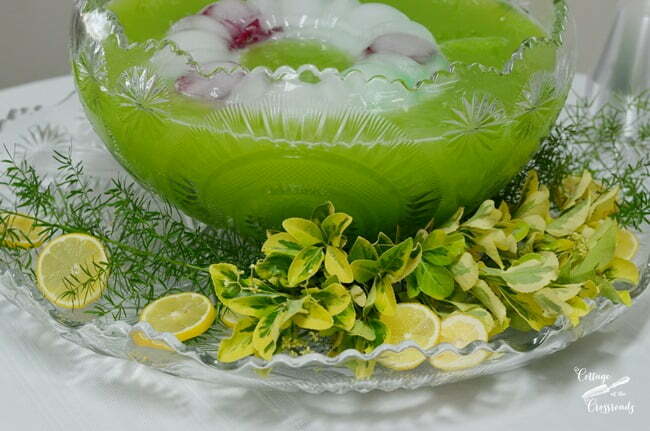 Add a few drops of food coloring into each bowl and stir thoroughly. Add a layer of colored filing. Spread one side of another slice of bread and place down on top of the filing. 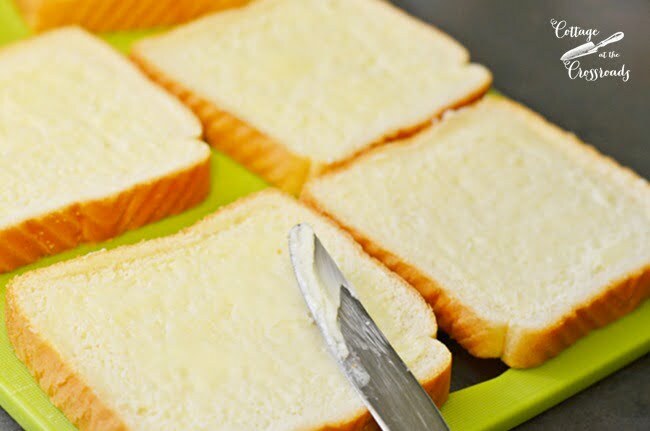 Add butter to the top of that piece of bread and add the next layer of filing. Butter another slice of bread and place down on top of colored filing. Cut each sandwich into 4 fingers about 1 inch wide. Cover with a slightly damp paper towel and plastic wrap until ready to serve. Use a serrated knife to cut the fingers and wipe the knife between each cut. One look at these delightful sandwiches and I started planning a tea party for my neighbors and friends. Did you ever get the green punch recipe? Would you mind sharing it with an “outsider”? I’d like to use it for a baby shower I am hosting. Patty, I never found out who made the punch but I ran across this recipe that sounds like it would be very close. Directions: In large pitcher or punch bowl, stir together sugar and water until sugar is dissolved. Stir in remaining ingredients. These are so pretty and I am sure quite tasty, too! What a pretty table! 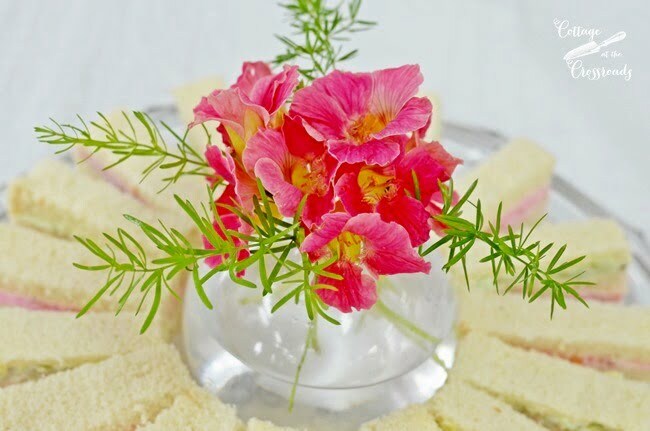 Love the simple flowers….and the punch looks delish!! I once owned a tea room and learned along the way, many secrets about tea sandwiches. First of all; most tea sandwiches can and should be be made a day ahead. Air is the enemy of tea sandwiches so to store pre made sandwiches, place in an airtight container lined with waxed paper and place a dry paper towel on top. Cucumber sandwiches should not be made until early the day I’d the tea. Sandwich plates can be made up early the day of the tea. When plate is done, cover with a well wrung out moistened paper towel and cover plate completely with Saran Wrap. Refrigerate until about 10 minutes before serving. Leave covered until just before serving and your tea sandwiches will be nice and fresh. Bonnie, thanks so much for your great tips! I need to do a post on those cucumber sandwiches, too. They are so delicious! I have never tried to freeze them, Liz, so I cannot answer your question. I’m thinking. though, that the sandwiches might get soggy if you did. many occasions when my mom made these treats! Oh, I can’t wait to make these. I would love to have the punch recipe too. I am going to make some for our family reunion. They look beautiful and are so clever. I am using this recipe for my uncle’s 85th birthday party. It will be a good old fashioned church social kind of party and I have never made tea sandwiches. My mother’s pimento cheese I have down, but I was at a loss for other sandwiches to do. The lime punch is intriguing though I think I am sticking with my favorite of red Hawaiian punch, ginger ale, and pineapple juice. Thanks so much for sharing this, Jane! I am definately going to make these at my next tea party – soon – for spring, I hope! 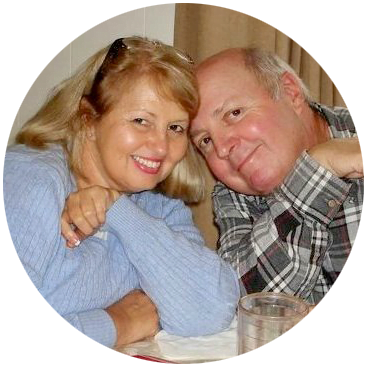 God bless – and I am saying a little prayer for your retired minister. I can only imagine how much you all enjoyed his retirement party. Take care. Thank you for showing us how to make and CUT the sandwich! I am wondering IF you would like to come help our church woman make Tea Sandwiches for 300????? LOL We are having our 1st Women’s Conference April, 15 and 16th. I sure do appreciate all your ideas!! Thank you so much for sharing this pretty recipe. i might make these for one of my sorority meetings or a baby shower and use pink and blue for the coloring. I hope your new Pastor will be a blessing to you. Merry Christmas. Your tea sandwiches are so pretty Jane! 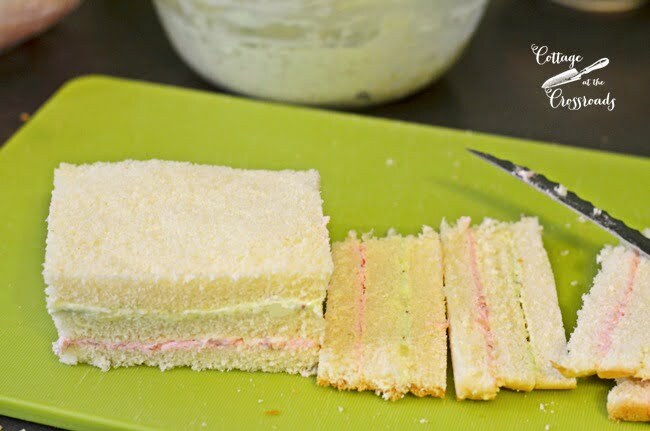 I’ve never heard of ribbon sandwiches, I love the layers of colors. 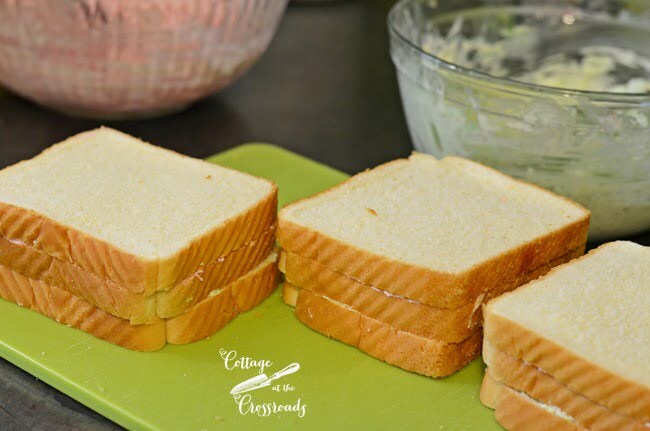 I’ve always used Pepperidge Farm thin white bread for finger sandwiches, it is harder to find like Libby says. 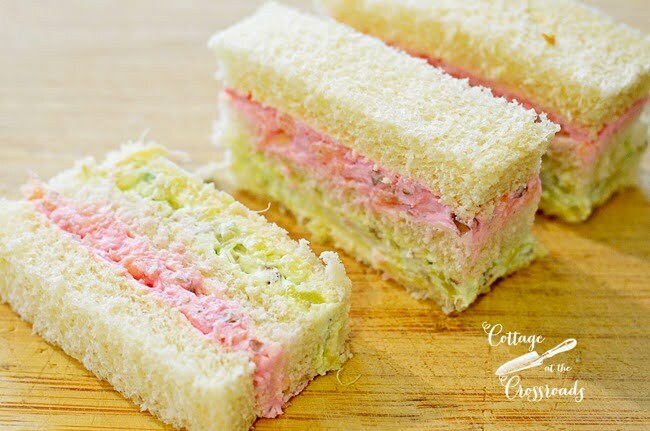 The ribbon sandwich recipe sounds wonderful…yes, I call them tea or finger sandwiches too…. A lovely table fit for a celebration of a person most well loved. Happy retirement to your pastor. Thank you Jane for sharing your recipe. They look so elegant and special. 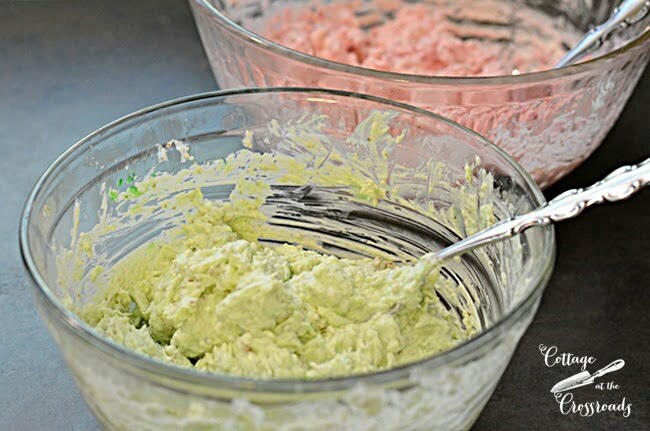 I am going to add your recipe to mine for when I have to make something for a special occasion. Best wishes to your pastor, I know it is a sad but happy time for him. God bless him and his retirement. 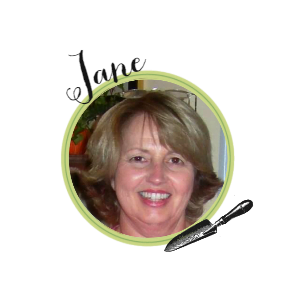 So pretty and fun Jane! 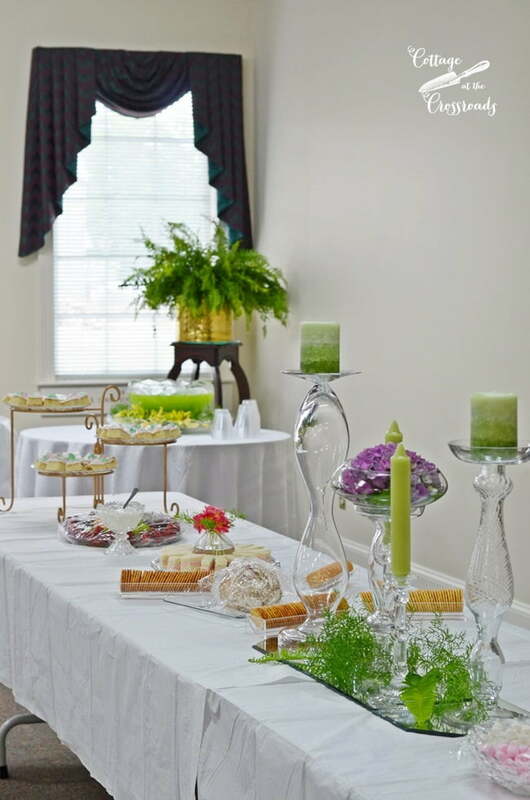 All these good, old-fashioned Southern reception foods bring back so many happy memories! Yum. I’m so going to use this next Sunday for a meeting after church. 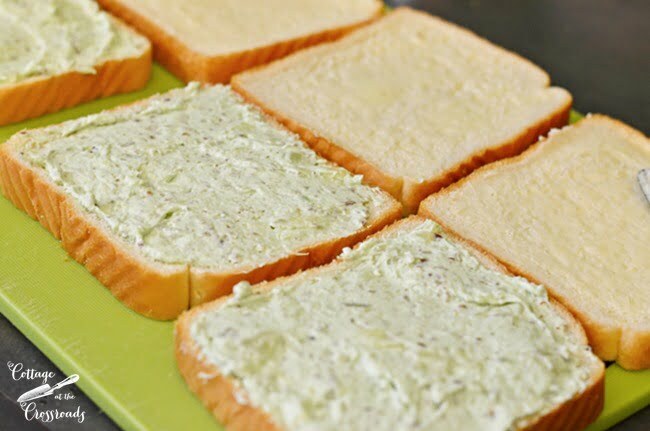 Do you have a tried and true cucumber sandwich recipe you would be willing to share as well? The table was so fresh with little expense and not too much work. Thanks for those ideas as well. We have a wonderful church community, Cindy. Thanks for visiting and leaving your comment! Oh, how pretty, and they sound very yummy! Thanks for dropping by, Sheila! You should serve them at your housewarming! Yes, I bet you remember these, Debra! would you give punch recipe? everything looked so pretty! Yvonne, I don’t have that punch recipe but I will ask around to see who made it. If I get it, I will either post it or send it to via email. Thanks Debbie! Lots of children were attracted to them because of the colored layers. The table looks so pretty with all the wonderful treats. 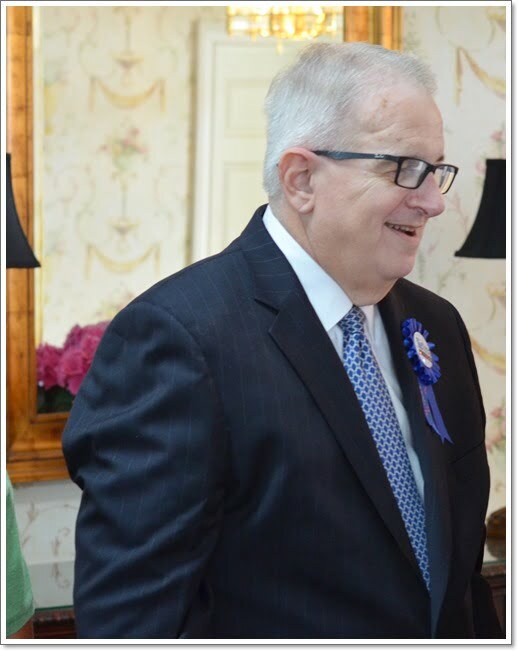 What a wonderful celebration for your retiring Pastor. We will really miss our minister, but I’ll make him some sandwiches anytime! Church ladies always have the best recipes. And your table is lovely. I’m sure everyone enjoyed the party. Saying good bye is easier with good food. You are so right, Linda. All the ladies at our church are awesome cooks and good food is always a balm for the soul! Jane: Have you ever tried the Pepperidge Farm thin sliced bread? It’s hard to find, and I think sells out very quickly, but each piece is about half the depth of regular bread. It’s what I always use for tea sandwiches! I used to make these often when daughter and I would have tea parties in the afternoon! And then I used cookie cutters: she was delighted! Going to print out this recipe and use very soon: thank you! That is such a good suggestion to use the thin Pepperidge Farm bread, Libby. I think I’ll make some cucumber sandwiches with it! I haven’t made them in a long time.They are so pretty,and the table looked so nice. Sometimes old-fashioned things are the best, especially in this case! Thanks Willa. The layers could be tinted to match the scheme of any party, couldn’t they? These look delicious and are so pretty! Your church’s refreshment table was so attractive. I’ll bet that all of the ladies admired it as they went through the line to get their food. Awww, thanks, Paula! I did get a few compliments on them-I think it was the butter that sealed the deal, though! I haven’t had those in many years and they surely do look delicious! I haven’t had them in a while, either, Pat. And I had never heard them referred to as ribbon sandwiches. But I sure am glad that I know how to make them now. Pretty sure they will become a regular at our family gatherings from now on. I love finger sandwiches. Abd that lime punch looked beautiful! Great job. I’ll try to get the recipe for that lime punch, Barbara. It was so refreshing and not overly-sweet as some punches are! Sounds yummy and they look so pretty too! Thanks, Martina! I taste-tested quite a few of them!! !